The National Centers for Environmental Prediction (NCEP) reanalysis data on tropospheric humidity are examined for the period 1973 to 2007. It is accepted that radiosonde-derived humidity data must be treated with great caution, particularly at altitudes above the 500 hPa pressure level. With that caveat, the face-value 35-year trend in zonal-average annual-average specific humidity q is significantly negative at all altitudes above 850 hPa (roughly the top of the convective boundary layer) in the tropics and southern midlatitudes and at altitudes above 600 hPa in the northern midlatitudes. It is significantly positive below 850 hPa in all three zones, as might be expected in a mixed layer with rising temperatures over a moist surface. 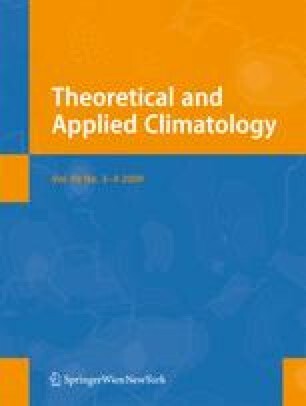 The results are qualitatively consistent with trends in NCEP atmospheric temperatures (which must also be treated with great caution) that show an increase in the stability of the convective boundary layer as the global temperature has risen over the period. The upper-level negative trends in q are inconsistent with climate-model calculations and are largely (but not completely) inconsistent with satellite data. Water vapor feedback in climate models is positive mainly because of their roughly constant relative humidity (i.e., increasing q) in the mid-to-upper troposphere as the planet warms. Negative trends in q as found in the NCEP data would imply that long-term water vapor feedback is negative—that it would reduce rather than amplify the response of the climate system to external forcing such as that from increasing atmospheric CO2. In this context, it is important to establish what (if any) aspects of the observed trends survive detailed examination of the impact of past changes of radiosonde instrumentation and protocol within the various international networks.